Truly Healthy Coleslaw Recipe, your whole family will love. Its one of my excellent healthy side dishes to have with so many healthy family recipes. Fresh homemade cole slaw is so simple to make and very cheap too. I love to nibble it straight from the fridge. Naughty but nice! Store bought coleslaw can be very heavily coated with mayonnaise which sticks to the arteries! This recipe uses much less. 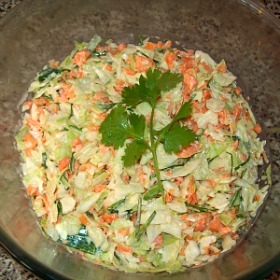 Follow my simple healthy coleslaw recipe, one step at a time. You can make this cole slaw in about 5 minutes. There are many different coleslaw recipes out there. In general, the main ingredients are white cabbage and carrots. I like to add a little white, red or spring onions and maybe red or green pepper. Whatever is in the fridge at the time. You can be as adventurous as you like. Go with your tastebuds! Sweetcorn, beansprouts or red cabbage, peppers and spring onions. The coating I make includes a small amount of light mayonaisse. Look for lighter versions of mayonnaise, which have very few E numbers, additives and preservatives. You will be amazed at what some manufacturers put in our food! The quickest way to make coleslaw is in a food processor which has a shredding attachment. 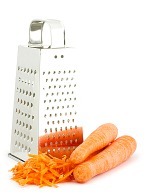 If you don’t have a food processor, you can use a hand held grater. It will take a few minutes longer to prepare the vegetables, but the end result is exactly the same. Just watch your fingers... Ouch! Remember to cut the celery and cabbage into small pieces using a knife. Peel and rinse the carrots. Cut 4 slices of cabbage, like you would slice a loaf of bread. Rinse thoroughly and pat dry with kitchen towel. Note If you are adding celery, it’s best to finely chop it by hand because celery doesn’t shred well in a food processor or a handheld shredder. 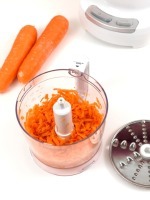 Using a blender with grating attachment, place the carrots in the shoot and push down with the shredder tool. Thinly slice the cabbage by hand. Shred any other vegetables you wish to add. Add all the cut and shredded vegetables to a large bowl. Add the light mayonnaise, lemon juice and olive oil to the vegetables and mix well to coat. Your healthy coleslaw is ready to serve. If you like it chilled, cover with cling film, a plate or foil and pop it into the fridge for 20 minutes. Freshly made coleslaw will last up to 3 days in the fridge. That said... there isn't much left in my fridge by the second day! It is sooooo much better for you than store bought and a lot healthier too! Coleslaw goes well with so many healthy meals and snack recipes. I'm sure you will have your own ideas too. Enjoy healthy cooking and eating well!